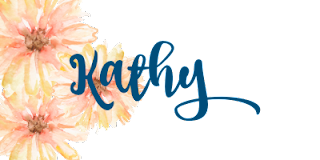 #stampinup #faithfulinkspirations Stampin' Up's "Ribbon of Courage" stamp set is one of my favorite sets in the catalog. I love the design--from Stampin' Up Million Dollar Earner Patty Bennett--and I love the font used for the sentiments. Plus, the sentiments say just the thing you want to say to someone who has been diagnosed with a scary disease or illness. Today's card is going to a special someone who is fighting the good fight against cancer and whose faith has never wavered during his fight--in fact, I think the fight has only served to strengthen him as well as those of us who love him! 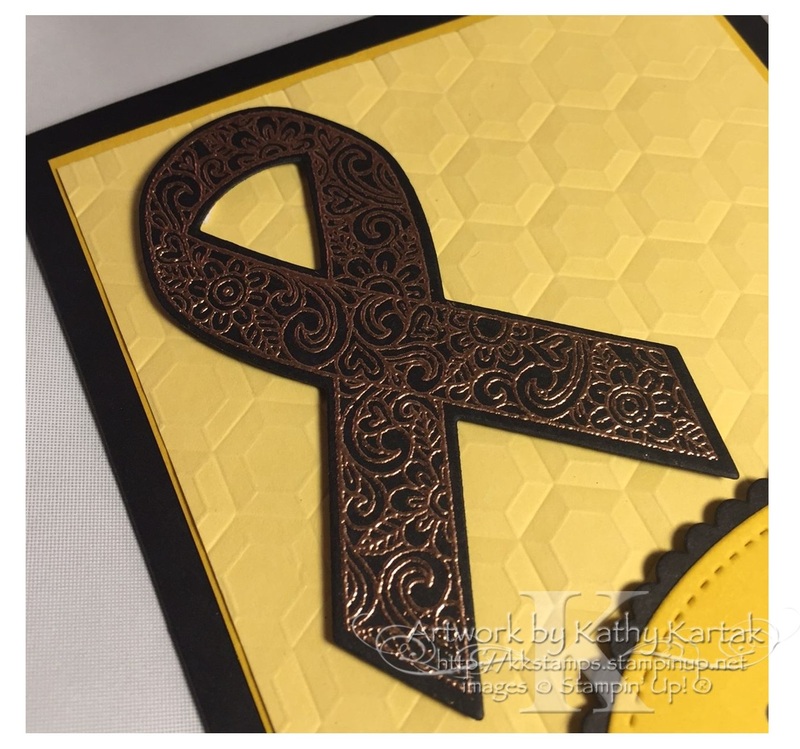 I started by stamping the filigreed ribbon in Versamark Ink onto a Basic Black scrap. I sprinkled on some Copper Stampin' Emboss Powder and set it with my Heat Tool. Wowza is that spectacular! I cut out the ribbon with the matching Support Ribbon Framelit. 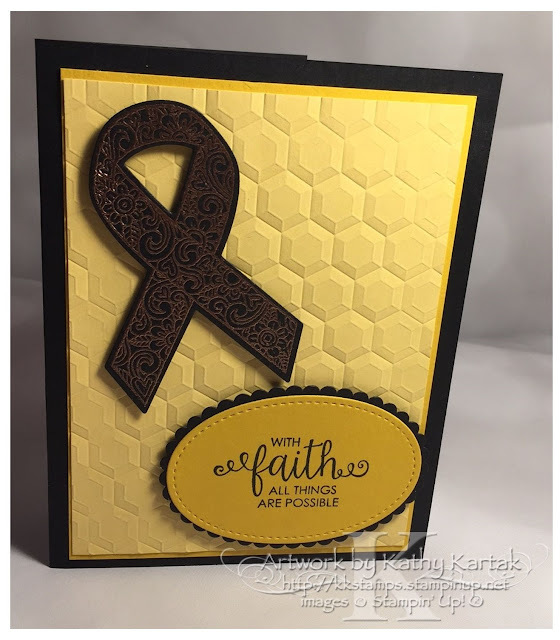 Next, I ran a 3-3/4" by 5" piece of So Saffron Card Stock through the Big Shot with the Hexagons Embossing Folder. I adhered this to a 3-7/8" by 5-1/8" piece of Crushed Curry Card Stock and then onto a Basic Black Card Stock card base. I stamped the sentiment in Basic Black Archival Ink onto a Crushed Curry scrap and cut it out with one of the Stitched Shapes Framelits. I adhered that to a mat that I cut out a Basic Black scalloped oval from the Layering Ovals Framelits. 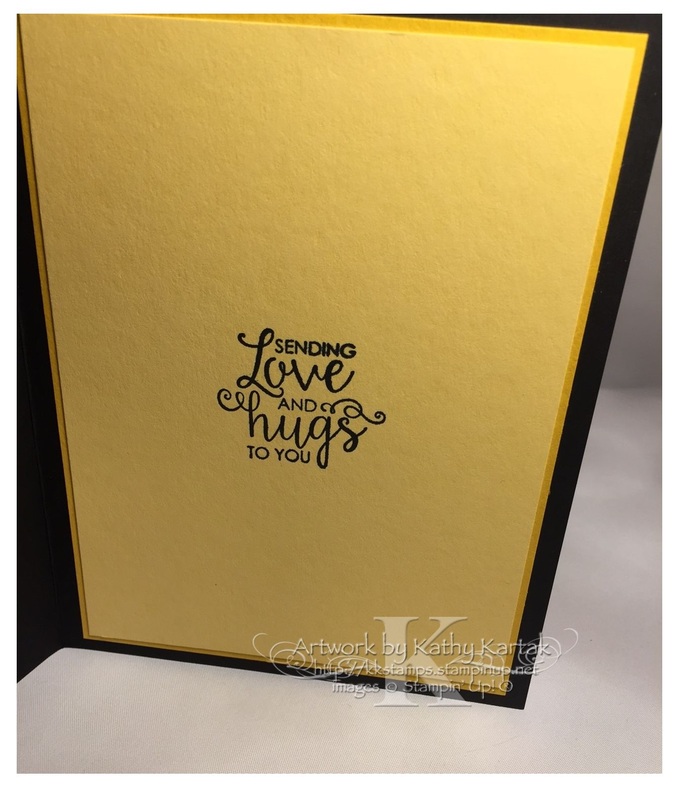 I adhered the oval and the ribbon to the card with Stampin' Dimensionals. I mimicked the front of the card on the inside by adhering a 3-3/4" by 5" piece of So Saffron Card Stock to a 3-7/8" by 5-1/8" piece of Crushed Curry Card Stock. I used another wonderful sentiment from the "Ribbon of Courage" inside. You can't go wrong owning this set. Its message of courage and love will brighten anyone's day!